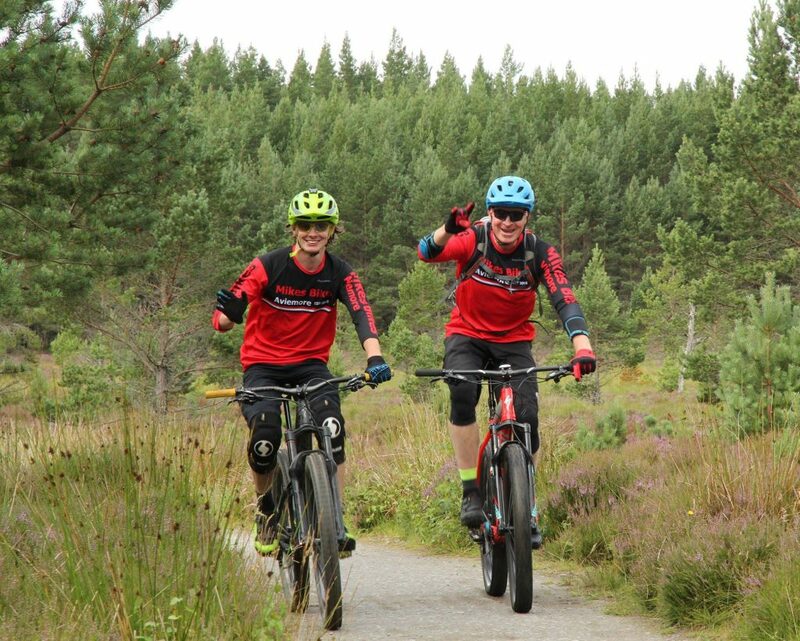 If you follow social media and forums you may think that a cycling trip to Aviemore may be full of steep, technical trails and big hill climbs – but it’s not, there’s something for everyone. 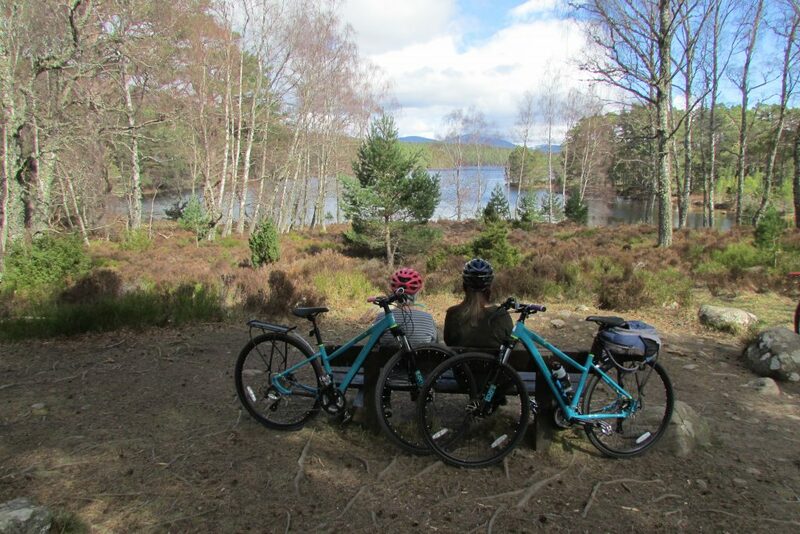 We have recently added some Saracen Urban X1 Hybrid Bikes to our bike hire fleet which are perfect for leisurely cycles around Aviemore along with our electric rental bikes, read on to find out about a gentle and picturesque 20 Kilometer loop for Hybrid bikes taking in Lochs and Cafes! 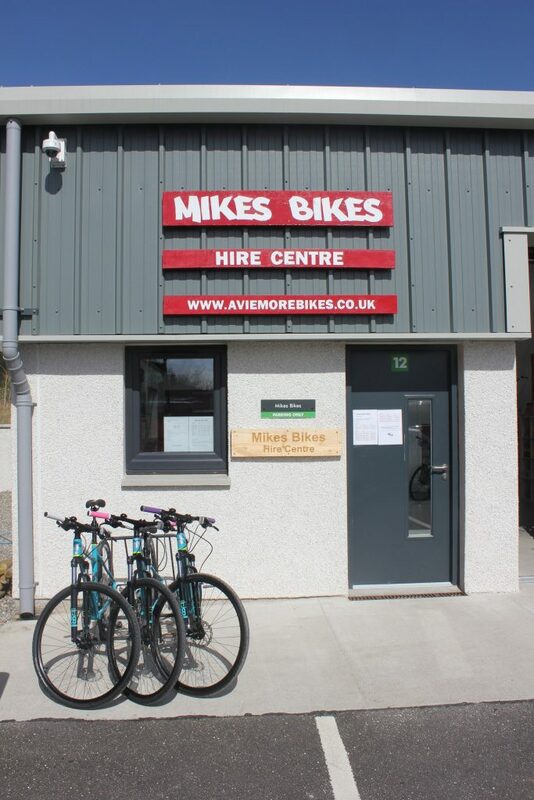 Start off at the Mikes Bikes, Bike Hire Centre located in the Dalfaber Industrial Estate at the north end of Aviemore. Next to the Hire Centre you will find Aviemore’s new (ish) cycling cafe, Route 7 Cafe start your ride off with coffee and cake in here! Or maybe a spot of breakfast, Route 7 has a large breakfast menu that is served until mid-day – perfect if you fancy a long lie. There’s bikes, a cafe and free parking at the Hire Centre. What could be better?! Anyway once you have fuelled up in the cafe head out of the Industrial Estate and join the cycle path that runs behind Aviemore Town Centre and leads you past the Old Bridge in pub and over the River Spey into Inverdruie. Once you reach Inverdruie follow the Old Logging Way Cycle Path for about 3 Kilometres until you reach the Rothiemurchus Campsite. This track is wide and smooth and perfect for Hybrids and Children. Upon reaching the campsite follow the Land Rover Track that runs parallel to the campsite, through the two gates and past the little ruined house. You will then have a gentle climb towards Loch Einich (but don’t worry we’re not directing you there) on a smooth wide path for a couple of kilometres through the Pine Forest. Then the climb becomes worth it when you look to your left and see the magnificent view of the Cairngorm Mountain Range, can you spot the Funicular Railway on the mountain? This is a great place for getting your Instagram Shots! The Old Logging Way Trail is wide and smooth. You will then enjoy a nice smooth downhill before turning right towards ‘Loch an Eilein’ don’t go straight on or you’ll end up at Loch Einich! Bump your way down towards Loch an Eilein for a couple of Kilometres, watch out for the little river crossings, before reaching the main track. Here you have the option of heading anti clockwise back towards Inverdruie or head clockwise to cycle right around the Loch. It’s not far and definitely worth it, it should only take around 30 minutes to cycle around Loch an Eilein and you will be able to spot the castle in the middle too! You will also find the Loch an Eilein Visitor Centre at the end of the Loch that sells a nice range of ice creams. However there’s nothing wrong with heading anti clockwise to shorten the ride. Enjoying the view over the Loch. Once you have cycled around the loch you will have clocked up 15 Kilometers and there’s two options for returning. You can follow the road back to Aviemore for a change of surface or you can head over Blackpark, there’s a small climb to the top but it’s not too strenuous and you’re almost home and after Blackpark it’s all downhill. You can then just head the same way back to the Hire Centre that you came in on and by the time you reach base you will have ticked off 20 Kilometres. So next time you are passing ask us for a copy of Mikes Bikes Map Number 2 which details the whole route and we can talk you through the route. 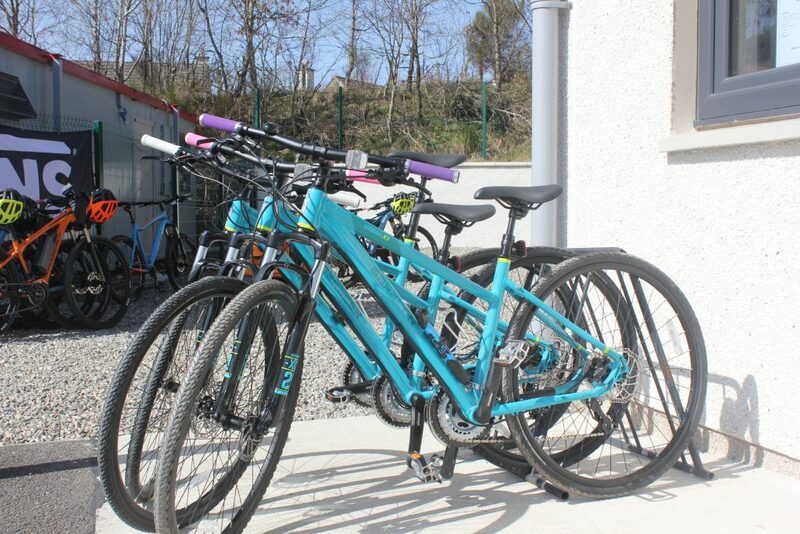 Contact hire@Aviemorebikes.co.uk or call our Bike Hire Centre on 01479 816 212 to reserve your bikes.